You've no doubt by now heard some news about Google today considering they are holding their annual Google I/O conference. 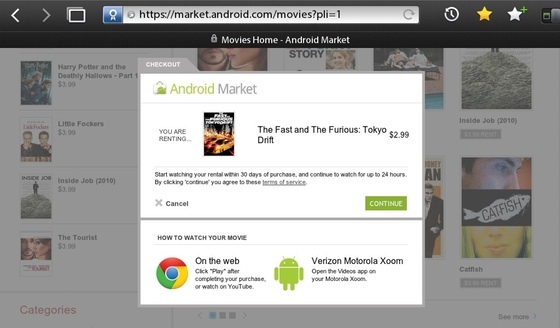 One of the larger announcements from their keynote, as noted by the fine folks over at Android Central was that the Android platform now has a movie rental service available to them from Google and YouTube. Major studios have signed on and the content being made available is rather broad and should be of interest to a lot of people. Google however neglected to mention one thing about the actual services -- it works for other platforms as well. BlackBerry PlayBook owners can already access the content right from within the BlackBerry PlayBook browser. You see, the offerings are powered by YouTube and visiting the YouTube movie site from your BlackBerry PlayBook allows you to login, rent and view movies with ease. In fact, you can even access it directly from the Android Market as well all from within the BlackBerry PlayBook. Pointless step, yes when you can just go to YouTube -- but the fact it allows you to do so is funny. So yes, Hulu and Netflix may be out for now -- but would YouTube really block the services? Not likely. Go ahead and give it a shot, let us know how it works for you. Keep in mind though, only available free videos can be played in Canada. Free and paid are available in the U.S.